I have tried to make navigating this web site as easy as possible. However I have had some feedback from visitors who needed some guidance. It appeared that these visitors weren't used to navigation on mobile equipment. I understand that for those people it may not be obvious how to navigate around this site if they don't recognize the icons in the top right hand corner of my web site. So here are some quick directions. I don't expect you'll need guidance here, but I'll mention it all the same. Main menu's consist of several topics with a title, a picture and a short description. Just click anywhere you like to open that topic, whether it is the title, the picture or the description. The main navigation menu is always in the top right hand corner of the page. It always consists of just 4 buttons. Some of these buttons don't necessarily have to be active all the time though. You can click on any of the active buttons. Hovering your mouse pointer over them before you click tells you where the buttons will bring you. The left pointing arrow will bring you to the previous page in a sequence of a multi page topic. The right pointing arrow will bring you to the next page of the sequence. At the beginning of a multi page topic the left pointing arrow is disabled because there is no previous page. The same is true for the right pointing arrow at the end of the squence. Both arrows are disabled on single page topics. The home button (the house icon) is the only button which is always active. And it will bring you..... back to the home page of course. That leaves us with the button with the three bars, the index button. This button usually brings you back to the index page. The index page is the first page of a multi page topic, which usually holds the introduction of the topic. The index button on the index page itself looks a bit different from the normal index button, because now the index button has an extra function, presenting the index itself. Notice the little down pointing arrow next to the three bars. 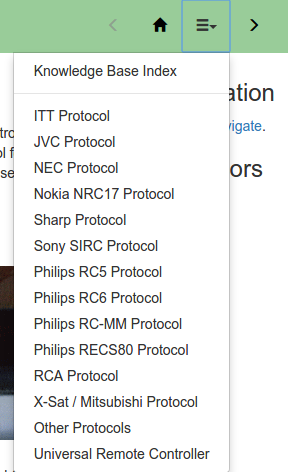 This index is a drop down menu. Just click on the index button and you will see the index. The first option always brings you back to a menu page, leaving this topic. Click any other link of the drop down menu to quickly jump to any particular page of the multi page topic. You can always find the links to the info pages in the lower right hand corner of the page. These links will bring you to my contact page (the mail symbol), a page about me (the little head) and the about SB-Projects page (the i in the circle). When you click on the last updated text at the bottom of the page you will be directed to the history pages. There you can browse through all the changes this site has gone through. Clicking on the copy right text in the left bottom corner of any page will show you my copy right notices.